We also have several pins that will help you express yourself in these politically trying times. We’re not saying they will bring about world peace, but see for yourself. Maybe they will. Looks like the hippie days are back! Sort of! They retail for $5.99, and each one comes on its own easy to hang recycled paperboard card. The rubber backing is soft and flexible so it won’t irritate you or your customers. We have many more styles available, and you can check them out here. 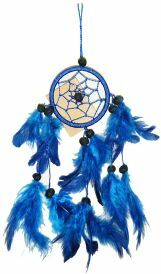 We have a beautiful new selection of wholesale dream catchers available! 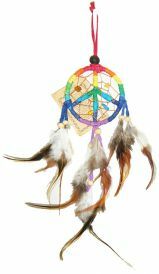 They are built around a sturdy wire frame, and decorated with small natural gemstones and feathers, and the bright colors really get your attention. They range in size from mini 7 inch ones, to very large ones with an 8 inch hoop and a total 16 inch length. There are some really adorable shapes available, like peace and hearts. Check it out! You can see the full collection here. Celestial Mists – the easy way to smudge! So we have these wonderful new mists with essential oils, and they’re such a fragrant and fun way to purify yourself and your space! We’ve especially been enjoying “Sacred Dreamtime” with the wonderful sage aroma! It’s like burning a fresh sage smudge stick, except so fast and easy. A few quick mists over yourself, and you feel refreshed and cleansed. These mists use the essential oils of plants, along with the energy of prayers, to achieve the same effects as the actual plants. The cobalt blue glass bottle holds quite a lot (4 ounces), so each one will last a long time. You can take them with you through your day, or keep one at work, to help refocus and achieve clarity through difficult times.